AN ANTI-BREXIT protest on the border between Ireland and Northern Ireland today saw traffic grind to a halt this morning as a number of vans, trucks and tractors formed a “go-slow” convoy on the M1 motorway. A fake customs post was erected to express fears about a return to a hard border after the UK leaves the EU. To emphasise their point, the protest simulated how a hard border would affect a farmer bringing a trailer-load of sheep to market, and a requirement to show your passport as you pass through. The protest was organised by Border Communities Against Brexit, who say that a return to a customs border would be a “huge step backwards” for their communities. They fear that Brexit would affect ordinary communities in the North badly, saying that farm incomes will be hit and jobs will be lost. It is believed at least 100 people took part in the protest, which saw traffic backed up near Ravensdale, Co Louth between the border of north and south. There is a real and deepening concern now, right across the border region, as to how Brexit will impact on businesses, tourism and on people who cross the border on a daily basis for work and education. Prime Minister Theresa May has repeatedly insisted that she did not want to return to “the borders of the past” when Britain leaves the EU. In the recently published white paper on Brexit from the British government, it said that it wanted to have “as seamless and frictionless a border” as possible between Northern Ireland and the Republic. Taoiseach Enda Kenny has also insisted on several occasions that he would fight against a hard border returning to this island. In recent days, the second All-Ireland Forum on Brexit heard Kenny reiterate, again, that “we must not return to a hard border”. Email “Anti-Brexit campaigners create 'mock customs post' amid hard border fears”. 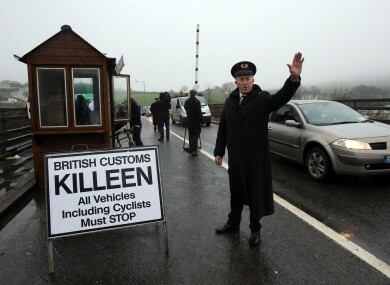 Feedback on “Anti-Brexit campaigners create 'mock customs post' amid hard border fears”.